China is expected to be the major contributor to the growth of the global planned liquids storage industry between 2019 and 2023, according to GlobalData, a leading data and analytics company. The company’s report, ‘Global Planned Liquids Storage Industry Outlook to 2023 – Capacity and Capital Expenditure Outlook with Details of All Planned Terminals‘, reveals that the global planned liquids storage capacity is expected to reach 94,559 thousand cubic meters (mcm) by 2023. Globally around 174 new liquids storage terminals are expected to start operations during the outlook period. China will be the global leader in terms of planned liquids storage capacity during the outlook period. The country’s planned storage capacity is expected to increase from 17,685.6 mcm in 2019 to 24,381.4 mcm in 2023 at an average annual growth rate (AAGR) of 8%. The country will also be one of the top new-build capital expenditure (capex) spenders globally during the period on planned and announced liquids storage terminals. 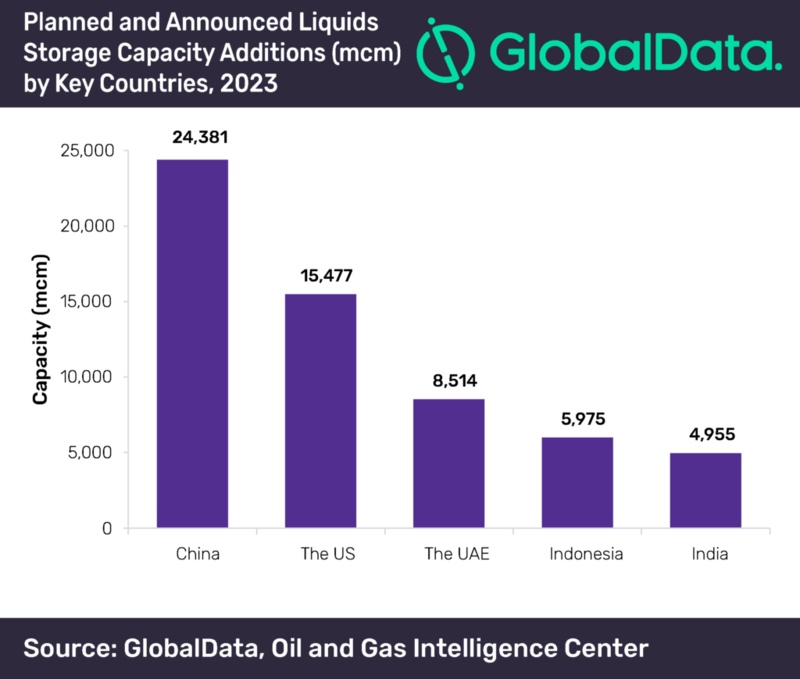 GlobalData identifies the US as the second largest country in terms of global planned liquids storage capacity in 2023. The country will have 15,477 mcm of planned liquids storage capacity in 2023. The planned liquids storage capacity in the country is expected to increase from 4,081.4 mcm in 2019 to 15,477 mcm in 2023 at an AAGR of 33.3%. The UAE stands third globally in terms of planned liquids storage capacity of 8,514 mcm in 2023. The planned storage capacity in the UAE is expected to increase from 1,476.0 mcm in 2019 to 8,514 mcm in 2023 at an AAGR of 43.8%. In terms of capacity, among the upcoming planned and announced liquids storage terminals globally in 2023, Zhanjiang IV terminal in China, Fujairah XVIII in the UAE and Lawe-Lawe CCT in Indonesia will lead with 7,000 mcm, 6,677 mcm and 3,975 mcm, respectively.